1) Tell us about yourself. Where are you from? Your friends and family? Hi! I’m from Indiana, in the middle of the United States. I’m an only child, and my parents both love to read, so I got an early start in the fantasy genre. My mom’s mother was also a writer, and I learned to type on her old typewriter. I’ve never wanted children, but I have three cats. I live in the country, surrounded by cornfields. I love nature, and enjoy hiking and bird watching. The books I have published so far are all epic fantasy, although later this year I’ll be publishing a series of urban fantasy novels set in Indianapolis. I like to say that I write about self-rescuing princesses. The main characters of my books are Prince Vistaren of Amethir and Princess Azmei of Tamnen. They agree to an arranged marriage to create a treaty between their two nations and hopefully end a war. Unfortunately, not everyone wants to see the treaty happen, and the villains are willing to kill to stop it. 3) How do you go about the process of writing and publishing a book? That’s a big question! 🙂 When I get an idea that I want to pursue, I start by getting to know the characters and then plotting the story out. I often end up deviating from my original plan, but it at least gives me a direction to go in. I write the first draft and try to let it sit for a while. Then I go back and reread the story, making notes about things I want to revise in the second draft. Once I finish the second draft, I send it to my critique partners and beta readers. When I get their reactions back, I revise again. The third draft is usually the draft that gets a careful copy edit and becomes the final manuscript. At this point I contact a cover artist if I’m commissioning art. I do all the print and e-book formatting myself in Microsoft Word. Once I have my art, I use Photoshop to create the full cover. I do a lot of design work for my day job, so I enjoy putting the cover together myself. I use Kindle Direct Publishing for Amazon, CreateSpace for my print books, and Smashwords for distributing ebooks to Barnes & Noble, Kobo, iBooks, and other stores. 4) Who are your cover designers and editors? 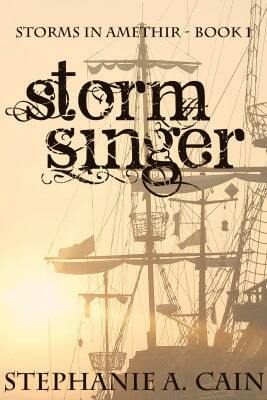 For my first book, Stormsinger, I did all the editing and cover design myself. I wrote and published it as part of J.A. Konrath’s 8-hour Ebook Challenge (I’ve written more about that on my blog here: http://www.stephaniecainonline.com/writing-an-e-book-in-8-hours/). For my second book, Stormshadow, I contacted an artist on Deviant Art, Phuoc Quan. He created art for that book and for an unrelated novella, Sow the Wind. For Stormseer, which is the third book in my Storms in Amethir series and is the fourth book I published, I commissioned art by Nicole Cardiff. I initially found her while I was looking on Pinterest for images to inspire me, and fortunately she was available! In December I published another novella in e-book only format, and I created that cover art using stock photography. I’m also creating the art for my urban fantasy series using stock photography. The upside of commissioning art is that you have a beautiful and unique cover. The downside is that it isn’t cheap! Stock photography is a lot more affordable, so I’m using that this year in order to save up for another cover (hopefully by Nicole). I’ve never paid an editor. I barter with two of my writer friends–they edit my books and I edit theirs! It’s a nice and inexpensive way to assure I’m putting out a quality product. 5) The landscape of indie publishing is constantly changing. But is there any thing about indie publishing that always remains the same for you? One thing about indie publishing that always stays the same is how much WORK it is! 🙂 Of course, modern technology has made it a lot easier to write and publish a book, but there are lots and lots of little details, and the way I’m doing it, I have to be the graphic artist, the formatter, the business manager, the marketing director, and the author all at once! Because I don’t outsource much of the work at all, it’s a time-consuming process. But I really enjoy the variety of tasks. 6) Since when have you been writing? I started writing my first novel when I was thirteen, and I wrote short stories before that. I don’t know exactly when I wrote my very first story, but I do have a vivid memory of writing a story for a school assignment in second grade, so I would have been seven. It was a thrilling fantasy story about a winged unicorn that had to repair a crystal hanging from a rainbow. It was pretty clearly influenced by the movie The Dark Crystal and a series of books I had read about unicorns! 7) Which authors and books have most influenced you? My favorite authors are C.S. Lewis and J.R.R. Tolkien. My dad used to read out loud to me, and he read The Hobbit first, then the Chronicles of Narnia, and then the Lord of the Rings. When I was about ten I discovered Tamora Pierce, and her stories about girls who want to be knights were a strong influence on me. Robin McKinley is another author whose characters and story-telling influenced me. Charles de Lint got me interested in urban fantasy, and when I started doing NaNoWriMo in 2003, that was when I learned how to plot and wrote my first urban fantasy novel. Another influence on my writing and publishing career is Laura VanArendonk Baugh, a fellow indie author who encouraged me to publish my first book and has been a mentor and great critique partner along the way. 8) Do you collaborate with other authors on anything publishing related? I’m currently co-writing a novel with a friend who lives in Tennessee. She and I met through the Harry Potter fandom and wrote fanfiction together for years, and we finally decided to write original fiction as well. That novel is a contemporary romance that we’ll probably publish with a pen name. 9) What has been your most successful marketing strategy? Joining with other authors to have massive two-day sales has been the best thing I’ve done so far. I just did that about a month ago, and June 2016 was my best sales month EVER. I listed one book as a free novel, and priced the rest of my books at $0.99 (except for Stormsinger, which is always free). Another important marketing strategy for me is getting Stormsinger listed as permafree after I published the sequel. People get to read the first book in my series free, and then there’s a teaser at the end of the book for the sequel. I’ve created a special short story that isn’t published anywhere except on my website, and readers can get that story free when they sign up for my email newsletter, which is how I keep everyone posted on my current projects, upcoming events, and release dates. 10) Do you have other hobbies apart from writing? I love to read, of course. I also like playing computer games–World of Warcraft and Skyrim are my current favorites. I play Pathfinder once a month with a group of friends. And as I mentioned earlier, I enjoy hiking and birdwatching. 11) So what’s your next release?